Last week our Bromsgrove office held a week of fundraising fun to raise money for Children in Need. All keeping in theme with Children in need, the team came up with colours and patterns they could wear each day to raise money for the incredible cause. On Monday the team wore hats, Tuesday was odd socks day, Wednesday everyone wore Pudsey’s famous yellow, Thursday everyone was branded with spots and on the official Children in Need Day everyone wore slippers – the perfect way to enter into the weekend. The team managed to raise an amazing £25 alone in donations and £18 in raffle tickets. 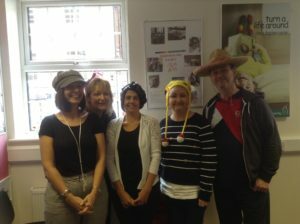 The team raised a total of £43, which will be doubled by PICS and donated to Children in Need. A big well done to everyone who got involved!